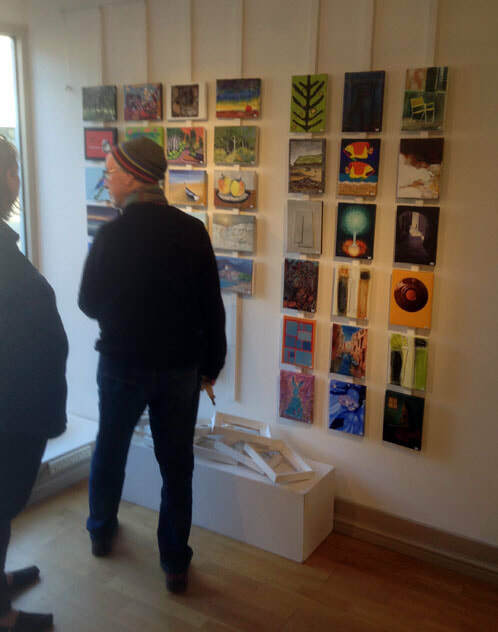 With rising costs for rent etc “The Eagle Gallery” in Bedford (my home from home) began a fund raising drive. Part of this was an exhibition of paintings called 40 for 40. Here the participating members were each given a canvas measuring 22cm x 16 cm to create an anonymous mini-masterpiece. Each would be sold for £40 with all proceeds going to the gallery. The purchaser would only find out the identity of the artist upon buying one. Mine involved a fairly rapid process with two sessions over two days. Basing the painting on a photograph my wife had taken of Stockwood Park in Luton. 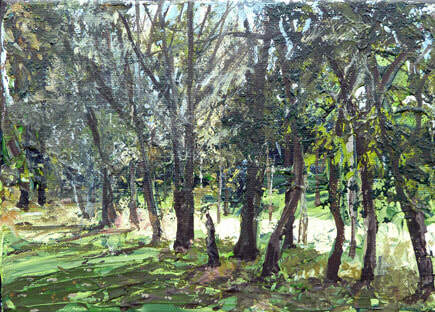 I wanted to convey the light coming through the trees with strong brush strokes and texture. Even on such a small canvas flailing around with a scourer and palette knives was a joy. I was delighted, that on doing my gallery duty on 3rd November, I discovered that mine was among the 14 that had at that point been sold. I’d held back adding this painting to the web site- but now it can be seen!